Today we are painting with our pastels our version of Monet’s water lilies and the bridge. This art lesson came about as a result of our learning with Passport France Download n’ Go by Amanda Bennett. 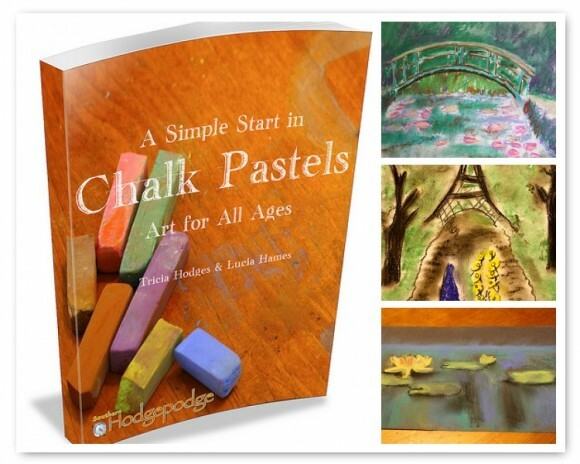 So, today we are not only offering this free chalk pastel tutorial but Unit Studies by Amanda Bennett has a fabulous giveaway in store for Hodgepodge readers, below! 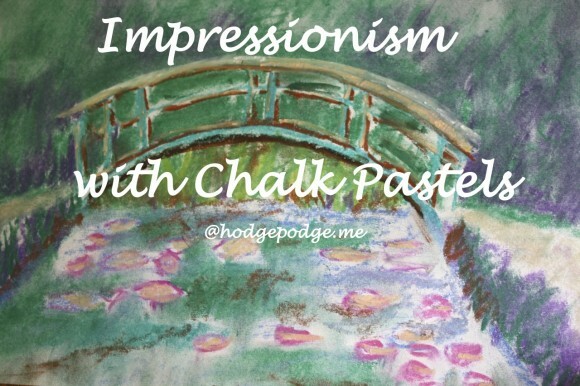 >Download your free Impressionism with Chalk Pastels: Monet’s Bridge Tutorial today. Subscribers will find it at the bottom of the subscription feed or subcriber email. **Would you like to see just how many of the art tutorials in A Simple Start in Chalk Pastels line up with Unit Studies’ titles? Amanda Bennett shared a list in her review A Simply Fun Start with Art. Plus we are joining up with Unit Studies by Amanda Bennett to offer this fabulous giveaway in celebration of Passport France! 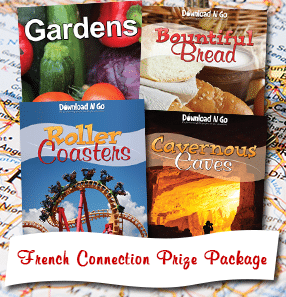 Passport France – Download n’ Go – Unit Studies by Amanda Bennett. Gardens? It includes Monet and his Giverny Gardens in France. Bountiful Bread? It includes France – baguettes. Roller Coasters? History of roller coasters – ice slides in France. Cavernous Caves? It includes Pierre Saint-Martin Cave, France. 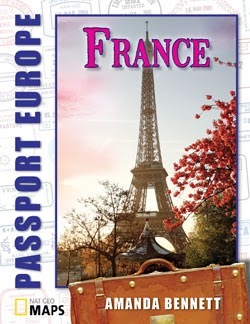 This week only, Passport France is on sale for just $6.00! Please see the Unit Studies specials page for more details. Also, in addition to the giveaway here at Hodgepodge, Amanda Bennett is giving away her Passport France resource books at the Unit Studies blog! And a special discount code! –> Thank you to our Hodgepodge subscribers! You can find your Impressionism with Chalk Pastels: Monet’s Bridge via a download link on our subscription feed or email. Not a subscriber? Please subscribe to Hodgepodge now (it’s free!) Don’t miss any art lessons! 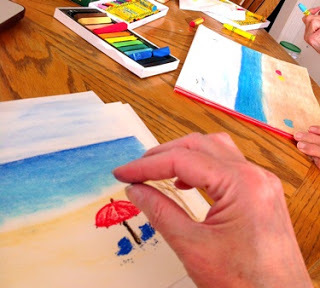 So does your summer include plans for art-filled afternoons? I love unit studies because it provides the opportunity to learn about something in great detail. I prefer to study things deeply & thoroughly as opposed to just touching on it. I love the fact that the whole family can participate in Unit Studies. I just tried to download it from my email feed and it wouldn’t let me. I don’t know whether the problem is on my side or yours, but I thought I would let you know. The link is corrected now – thanks for patience, friends! No problem. Thank you for all the time and effort you put into it. We have really enjoyed our first Amanda Bennett unit study on America’s Heroes. I can’t wait to share my love of all things French with my kiddos! I teach our three children at home and I am always looking for more interesting tidbits to make our learning more fun and interesting. 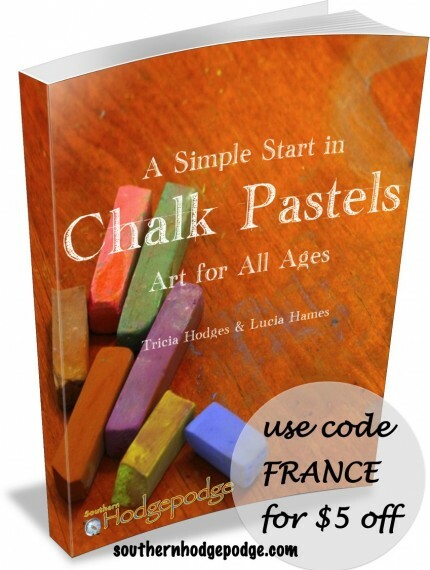 Personally, I love chalk pastels and I love these art tutorials. The giveaway is also interesting to me. Perhaps I can brush up on my own rudimentary pastel skills, too! When we are doing unit studies, we get to choose the topics that interest us. Besides, the boys don’t consider it “schoolwork”, so they are learning much without even noticing. I agree Heidi – all of the unit studies we’ve enjoyed through Amanda Bennett have been just as you described! Learning FUN! Your link to download the tutorial doesn’t work. It would go great with the Art Studies we plan on doing during the summer. Can you redo and resend it, please! Thanks! Thanks Dee – it’s fixed now! I think being able to focus and go more in depth on a topic that interests us. My kids love unit studies. We love to study a topic in detail. We like the in depth study in a unit study. Plus it includes other subjects. Unit studies allow flexibility to change things up, and study and learn about something we are all interested in! They allow to learn deeply about any given subject, and include multiple studies of academics. I call that fun!!! The flexibility and the hands on learning. What I like best about unit studies is that they give the child the chance to explore a topic throughly, in many facets. These look fantastic and would complement our french foreign language studies and geography! We haven’t really tried unit studies though I have heard a lot of good about them. Winning one of Amanda’s studies would be a great introduction to doing them I’m sure. Thank you for a great give away. They are organized and relevant, plus not specific to one grade interest. Unit studies are great in that they wrap in everything you need to learn in a day with a central subject. I’ve never tried a unit study before, but I like the in-depth study of a subject. Love that my whole family can do it together.